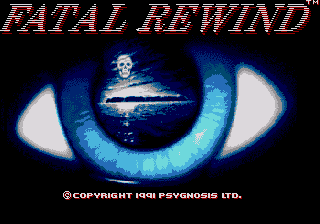 Fatal Rewind, known as The Killing Game Show (キリング・ゲームショー) in Japan (and on other systems) is a platform shoot-'em-up developed by Psygnosis and published by Electronic Arts for the Sega Mega Drive in 1991. You have to clear mazes with puzzle sections while fighting off enemies. All stages have a time limit, which is enforced by a constantly rising liquid that destroys the player on contact. After losing a life, the game replays your gameplay. You can interrupt this by pushing any button except , and continue from the current position in the replay, jumps, tapping fires while holding down is for using items, is for fast forwarding during a replay. The game features a score system and adds points based on playtime (similar to games such as Space Harrier), but the counter can be cheated due to infinitely respawning enemies and deliberately drawing out stages as long as possible. The Amiga original featured 8 worlds with two stages each. This has been cut down to 6 worlds with 2 stages each. As the cut worlds didn't feature anything that wouldn't have been possible on the Sega Mega Drive hardware, ROM size restrictions or the publisher not investing into bigger ROMs are possible reasons. Liquids are reflective in the Amiga original. The effect was not, perhaps could not be, reproduced for this port. The map function from the Amiga version is missing. Main article: Fatal Rewind/Magazine articles.